Unexpected cessation of production due to technical faults is the operator's true nightmare, especially if recovery operations require equipment that is not readily available or when operations can only be executed in certain annual seasons. Given these considerations, operators often face the nagging decision during the planning of a work-over operation: should a functioning component, which is known to be prone to breakdown, be replaced or should it be left in place and should operations continue until the part eventually fails. Pro-active replacement might allow the operator to fit the intervention into a larger planned operation and reduce, or eliminate, the risk that failure occurs at an undesired point in time. A North Sea operator was planning an operation in which a number of failed sub-sea oil pumps were going to be replaced and a decision had to be made whether some, or all, of the pumps that were still functioning should be replaced during the operation. A simple decision model was constructed that provided insight in the likelihood that failure of the running pumps would occur in the upcoming winter season and how much revenue potentially would be lost whilst waiting for the appropriate equipment to arrive. The model used historical pump failure data and accounted for different causes of pump failure. Uncertainties typically addressed in economic models include reserves size, required investments and future hydrocarbon prices. Although the financial impact of planned facility down time is frequently assessed using a general set of assumptions, the impact of an unexpected catastrophic failure of equipment is rarely assessed in great detail. Although the impact of these events over the total projects lifetime in NPV terms might not be sizeable, i.e. future cash flow will simply be deferred to the future,1 the short-term impact could be catastrophic. Annual production targets might not be met, and the interruption of short term cash flow might have serious adverse effects on ongoing corporate operations. The analysis described in this study is largely based on the application of the Weibull distribution. This type of distribution is named after the Swedish engineer Waloddi Weibull9 (1887-1979) who popularised its use for a wide range of reliability analyses as discussed in a landmark paper published in 1951.9 The Weibull distribution is particularly suitable for reliability analysis in which a failure rate, the probability of failure per unit of time, is not constant over time and only limited historical data on past occurrences of failure are available. Just as human mortality rates are a function of age, i.e. mortality rates amongst newborns, teenagers and elderly humans are higher than mortality rates of middle aged adults, failure rates of complex machinery is expected to change during the lifespan of the equipment. Utilisation of the Weibull distribution enables engineers to map out evolving failure rates for different causes of machine failure. Heavy oil has been produced from a North Sea field by means of a series of submersible pumps. Ever since production started in the 1990s, unexpected, though regular, pump failure has frequently challenged the operator to meet its annual production targets. The problem of pump failure has been magnified by the difficult access to the systems. Operations cannot be executed in the winter season due to adverse weather conditions and intervention requires expensive specialised equipment with long lead times. Given these considerations, the operator faces the difficult decision during the planned work-over operation: should a functioning pump, which is known to be prone to breakdown, be replaced or should the device be left in place and continue to operate until failure occurs. The operator faced 32 pump failures hitherto and tracked 1) the time of operation of each pump till failure occurred and 2) the cause of failure. The data indicates that a common cause of pump failure relates to corrosion of one specific part of the type of pump employed. 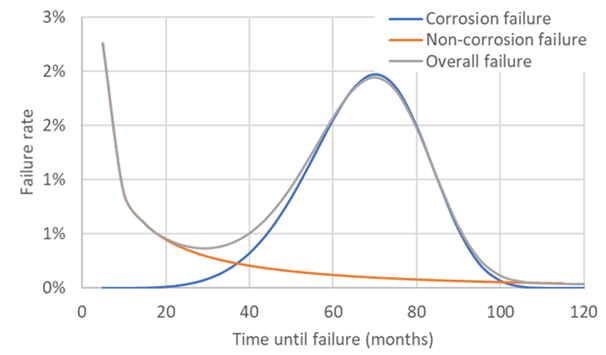 On the basis of this finding the failures were divided into two groups referred to as corrosion and non-corrosion failures and two separate Weibull distributions have been developed for each type of failure (Figure 1). Figure 1 Two fitted Weibull distributions, one for corrosion failure and a second for non-corrosion failure. A key attribute of the Weibull distribution is that failure rates evolve over time, i.e. non-corrosion pump failure rates are high immediate after installation but tail off over time. Figure 2 suggests high failure rate in the first 12 months and in the 5th year due to non-corrosion and corrosion failure, respectively Figure 3. Figure 2 Failure rate for the corrosion, non-corrosion and overall failure. Figure 3 The overall pump survival rate is a combined effect of two causes of failure; corrosion and non-corrosion. The graph suggests that the chance of pump is operational after 10 years is about 2%. The reliability of the pumps currently in operation was assessed using the Weibull distribution that described pump failure due to the both corrosion and non-corrosion causes. Given that the pumps have been installed at different points in time each pump has a unique expected remaining lifespan. Table 1 illustrates that five pumps that have been operational for a different amount of time have a unique probability of failure in the coming 6 and 12 months. A simple decision model was developed to provide insight into the strategic opportunities available to the operator: no-intervention or a pro-active work-over. Key considerations in the decision include: what is the likelihood of failure during the winter season and how much loss of revenue can be expected if failure occurred, what is the cost of pro-actively replacing the pump and if pro-active replacement is favourable which pumps should be replaced first. The no-intervention scenario was assessed using the overall Weibull distribution (accounting for corrosion and non-corrosion failure) in combination with assumptions of expected downtime following pump failure and costs associated with the operation to resume production. A Monte Carlo simulation was used to probabilistically assess the time to pump failure, the time required between pump failure and the work-over operation and the lifetime of the next pump to be installed in the well. The results of this analysis were subsequently compared to the alternative development option of a pro-active intervention during the already planned work-over operation. Several recent studies explored machine learning to predict ESP failure.11,12 Unfortunately, many real-life cases lack the large volume of high quality data required to implement robust machine learning algorithms. The issue of sparse data can be illustrated by this case study. After the recognition that pump failure was frequently caused by corrosion of one specific part of the pump, action was taken to change the design of the pumps which resulted in a greatly reduced likelihood of corrosion failure. 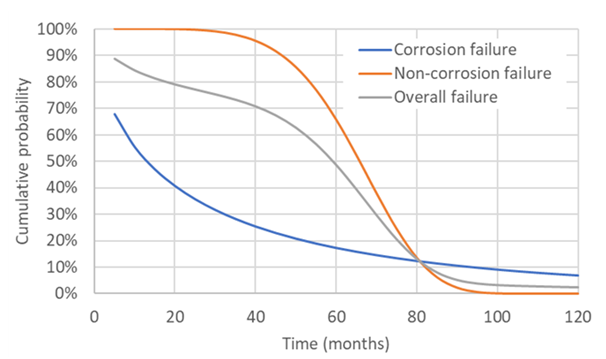 Failure rates and expected lifetime of the newly designed pumps can be readily described by the Weibull distribution developed for the non-corrosion failures. However, the size of data set required to train machine learning algorithms has been greatly reduced because the type of historical failures that occurred in the past might not occur in the future. 1Deferring future cash flow with one year will decrease the projects NPV with 10% assuming a 10% discount rate. The versatility of the Weibull distribution allows operators to make quantitative probabilistic assessment of the reliability of the systems they operate and assess the commercial impact of catastrophic failures of this equipment. The results of the probabilistic decision model provide a project team a solid understanding of different outcomes, their likelihood of occurrence and the associated commercial consequences. This improved understanding will subsequently greatly improve the level of discussion of the different options with the other stakeholders in the project and ultimately lead to better decisions whilst developing an asset. The importance of reliability analysis will be become progressively more important given the rising costs and risks of the operations executed in the upstream oil and gas industry. The importance of having an in-depth understanding is further compounded by the fact that equipment is aging in mature basins and equipment is employed in increasingly challenging locations such as the Arctic and deep water. The analysis of down-hole pump failure described in this study can easily be applied or expanded to other pieces of machinery that are prone to failure. Probabilistic economic models are often associated with large green field investments or high capital-intensive M&A decisions, however, the results of this analysis underpin that these types of models can provide key insights in operational decisions to be made during the progressive development of brown field assets. Bickel JE, Bratvold RB. Decision making in the oil and gas industry: From blissful ignorance to uncertainty induced confusion. USA: SPE 109610; 2007. 15 p.
Rose PR. Evolution of E & P Risk Analysis (1960-2017) Presentation given at AAPG 100th Annual Convention and Exhibition. Houston: Texas; 2017.45 p.
Willigers BJA, Bratvold RB. Valuing oil and gas options by least-squares Monte Carlo simulation. SPE 116026. 2008;4(4):1–10. Kannan J. Successful ESP operation ADCO - SHAH FIELD. USA: SPE 177544; 2015. 9 p.
Urban A, Boechat N, Haaheim S, et al. MOBO ESP Interventions. USA: Offshore Technology Conference, OTC 26125; 2015. 19 p.
Rafael L. Ten year ESP mean time between failures, reality or fiction. USA: SPE 182925; 2016.12 p.
Mohannad A, Rafael L, Xiao JJ. ESP data analytics: Predicting failures for improved production performance. USA: SPE188513; 2017. 17 p.
Guerra FW, Cortina N, Franco L, et al. ESP Root cause failure analysis in Guatiquia Field, Colombia: A case study. USA: SPE-185274; 2017. 11 p.
Weibull W. A Statistical distribution function of wide applicability. Journal of Applied Mechanics. 1951(18):293–297. Alhanatic FJS, Solanki SC, Zahacy TA. ESP Failures: Can we talk the same language? SPE ESP workshop Houston: USA; 2001. 11 p.
Guo D, Raghavendra C, Yao KT, et al. Data driven approach to failure prediction for electrical submersible pump systems. SPE 174062; 2015. 6 p.
Sneed J. Predicting ESP lifespan with machine learning. USA: URTEC 2669988; 2017. 7 p.
©2018 Willigers. This is an open access article distributed under the terms of the Creative Commons Attribution License , which permits unrestricted use, distribution, and build upon your work non-commercially.